Right now it seems this New Year will be quite unlike the previous ones, which makes us want to speak out. What will happen to us and to the country? Well, all we can do is grab some popcorn and watch ruble’s exciting adventures. 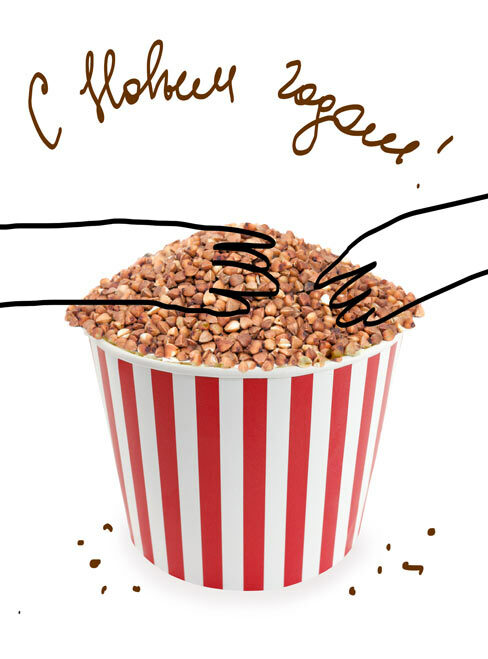 By the way, why popcorn? Buckwheat, we should grab some buckwheat! 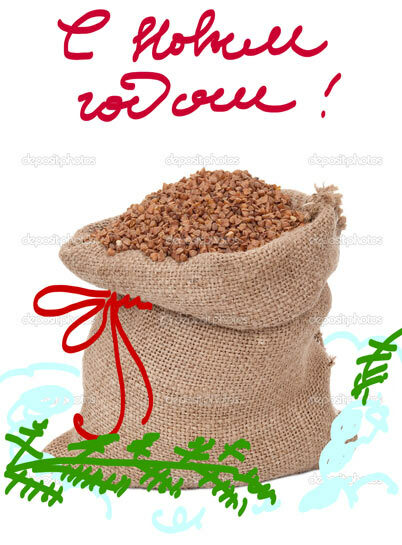 Or, as an alternative, Santa Claus brought us some buckwheat in his bag. Art director: The first one. Drawing the cup, adding buckwheat, taking photographs. Deciding to turn it into a Christmas poster. Starting to work on the Christmas lettering, so that the text is a simple “Merry Christmas!” but brisk and lively. The calligrapher takes his pens and starts to warm up. Scanning, typesetting a couple of alternatives and sending to the art director to make a choice: a grotesque or a script typeface, in a frame or in an ornament. Art director: Go with the ornament and the script. Just be sure to show the lettering to the type designer before you print it. Type designer: The C is unstable, the P looks like it’s pinned to the rest of the letters, the slant is different for all letters and the overall look is shy and cramped. And how was it supposed to be?.. Calligrapher: ...brisk and lively. Got it. The type designer is satisfied, the art director is satisfied. To the press!